Chris’s Chicken Salad is a delightful switch from chick'n salad you would normally get from the supermarket. Not masked by too much mayonnaise or salad dressing, the chicken, celery, grapes and apple pieces gently poke through so you taste each on its own. What you will find is a refreshing salad that melts in your mouth while giving you some crunch. 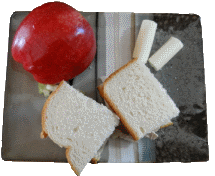 Truly a very light mouthwatering delight when served with two slices of country white bread, string cheese and a half apple. Whatever whole breast chicken you prefer, it needs to be cooked thoroughly without turning it into a brick, so watching the boil is important. We have tried all different chicken brands but since we have discovered Bell and Evans chicken, we enjoy the true taste of antibiotic-free chicken. Not all markets carry this brand, so we tend to shop different markets in our area that we know so when our regular market is out we go to the next market to pick up what we need. Bell and Evan chickens are fed an all-vegetarian diet of pressed soybeans with corn and amino acids. And you can tell the difference in color, taste and texture. Everyone has their taste for different kinds of meat, vegetables and dressings, and we are no different. Our suggestion is to use what you have enjoyed and what fits into your budget. We enjoy certain things too and have tried this recipe with different ingredients and got different results, but we encourage you to use what you have first then try it as listed in the recipe. Boil chicken until done inside… (No pink). Rinse and let cool. While the chicken is cooling, slice the grapes in half and then quarter. Dice Celery into edible pieces that suit your palate. Cut the chicken into bite-size chunks or hand pull the chicken breast apart to make it string like. Blend all in a large bowl and add the salt and pepper. Add the two types of mayonnaise and let stand for 10 minutes. Adding a piece of fruit and cheese will interest your kids. Garnish with string cheese and the rest of the apple or grapes. Tastes great when the country style bread is lightly toasted. Add a slice of American cheese or cheddar for extra flavor. Add more sandwich spread or mayonnaise if you prefer more moisture. 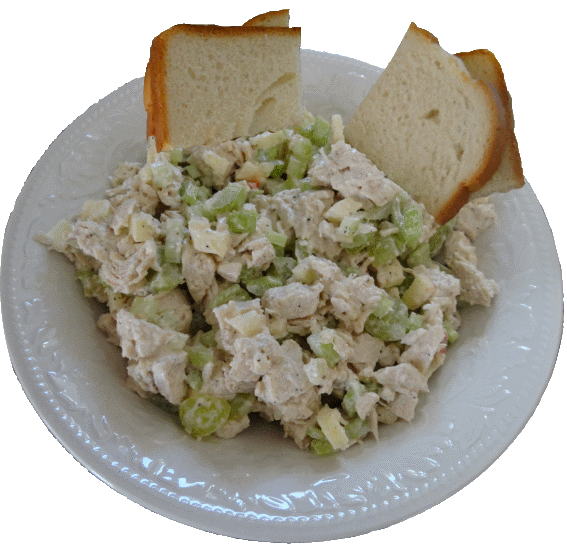 Return to Home Page from Chris's Chicken Salad.